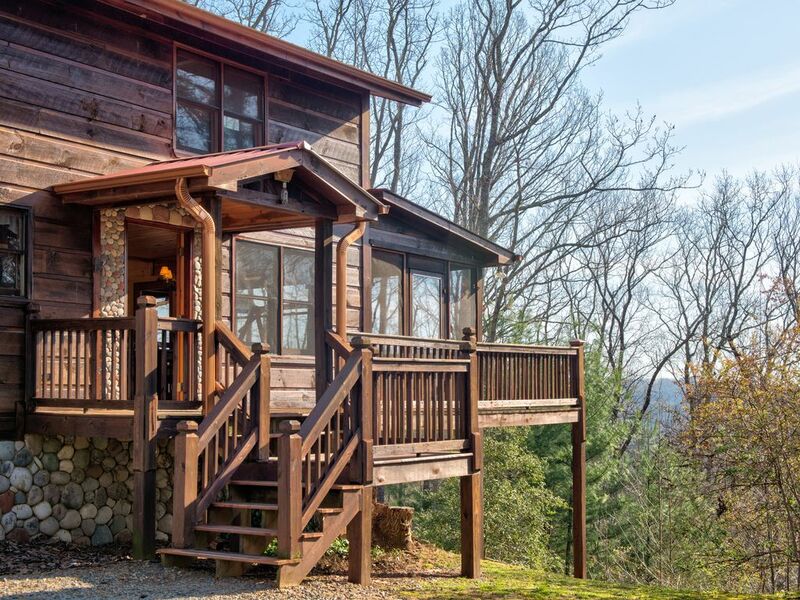 This beautiful Blue Ridge cabin with a private hot tub, wraparound deck, outdoor firepit, and much more is waiting for you to make some memories with your favorite traveling companions. You'll revel in seclusion and easy access to town, and you can even bring along your two dogs for a small nightly fee! Bask in tranquility on the large, wraparound deck, surrounded by stands of trees, then head six miles to town and pick up ingredients for a delicious home-cooked meal. Or treat yourselves to a meal out at one of Blue Ridge's fine or casual dining establishments followed by some gallery browsing or live music. Hike the Appalachian Trail, go mountain biking or horseback riding, or take a relaxing ride on the scenic railway. Wrap yourself in the comforting warmth of this home, which features an all-wood interior and a gas fireplace that rises to the ceiling. Curl up during the winter and watch some cable TV or a Blu-ray. You'll also have free WiFi to keep you connected and the central AC will keep you cool in the summer. Other bonuses are the Ping-Pong, pool, and air hockey tables, and you can pack light, thanks to the private washer/dryer. The gas grill will keep you well fed on those nights you'd rather not make a mess in the full kitchen, and after dinner, relax on the lovely wraparound deck or gather at the outdoor firepit, then partake of some stargazing while you soak in the bubbling hot tub. This Blue Ridge beauty awaits your arrival. Book it today! My family and I enjoyed the stay mainly due to the sunrise and sunset we could see from the porch. My in laws enjoyed the hot tub, fire pit, and comfort level of the home as well. Thank you for letting share your beautiful cottage. My children enjoyed the darts, pool table, table tennis, the hockey table and most of all the piano. It was very ideal to our quiet family get away. Thank you for sorting the internet very quickly too. Managenent was amazing. This was our first trip into the maintains and OMG it was totally worth it. The cabin was super clean and comfy and the views were amazing. We would definetily come back again.